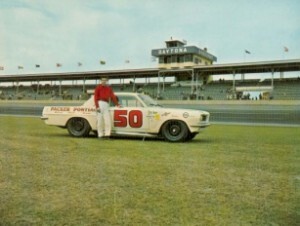 Pontiac achieved racing success with the Pontiac LeMans Super Duty when it won the 1963 American Challenge Cup in Daytona. The race was run on the oval and contested in a driving rain storm by a small but eclectic mix of cars which included a number of Ferraris, Porsches and Corvettes. Reports published at the time indicate the car was equipped with a dual four barrel equipped 421 CI engine (6.9 liters), a four speed semi-automatic transaxle and aluminum bodywork. The car’s luck ran out the next day when Goldsmith completed only three laps of the Daytona Continental before retiring with what was reported as a fuel pump failure. Subsequent interviews with Goldsmith and Nichels gave the reason for the DNF as a driveline failure. From here the car’s history becomes murky at best. GM would reiterate its support for the AMA racing ban in early 1963 and a number of GM’s racing programs were shut down, including this one. Number 50 would be offered for sale and eventually be sold to Mercedes Benz in Germany for use in a competitive analysis. One memo exists detailing the results of a preliminary analysis by Mercedes. From there, the trail goes cold. We know the car was offered for sale later that year and purchased/evaluated by Mercedes. Is there any other information available on the sale, evaluation, etc. ? The Homologation Papers for the 1963 LeMans are not to be found anywhere. The car was homologated on October 8, 1962 under recognition number 78. We have tried the FIA, ACCUS, SCCA, NASCAR Archives, Daytona Speedway Archives, etc. with no luck. Does anyone know where these can be found?